Wind historian extraordinaire Etienne Rogier sent me a carte postale (post card) promoting a 1988 French postage stamp. The card depicts the postage stamp and an experimental Darrieus turbine. 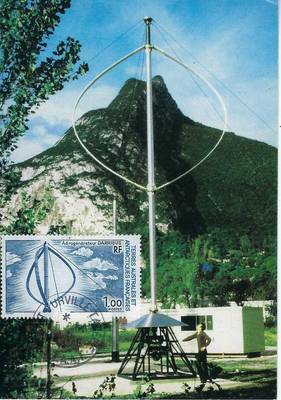 Rogier explains that the experimental turbine on the post card was that of the Centre d'Études Nucléaires de Grenoble (CENG), which was working on VAWTs in the 1970s and 1980s. I've long had an image of the postage stamp on the pages of Cultural Icons Featuring Wind Turbines under postage stamps. This particular image can be found under France and celebrates a Darrieus wind turbine used on a French Antarctic base. 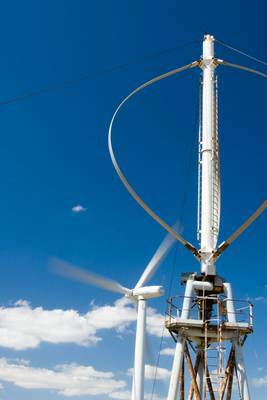 It appears that CENG installed a turbine at the Chateau Lastours test site in southern France. It was standing idle and long abandoned when I photographed it on a visit in 2005.